Richard A. Laible, age 76, of Sheboygan, WI, passed away after a valiant battle with cancer, on Saturday, December 1, 2018. He always had a positive attitude, never one to complain. He fought his battle with silent dignity, strength, and determination which was true to his character. Richard was born in Freeport, IL, on September 18, 1942, son of the late Raymond and Leona (Drake) Laible. He graduated Freeport High School in 1960, went on to the University of Iowa and graduated with a degree in Speech with a radio, television, film concentration. In between his college studies, he was hired to work as a page on The Tonight Show in Burbank, CA. After that, he returned home and went on to serve in the U.S. Army posted in Germany before completing his degree from the University of Iowa. He married Janet Whitney in 1965. Together they had two children, Randall and Claire. In September, 1974, he married Linda Gessert in Milwaukee, WI, where they resided for one year before moving to Chicago. He spent the majority of his career as an advertising and marketing consultant. He worked on several advertising campaigns and brand designs for Frito Lay, Pizza Hut, Hallmark Cards, Kraft Foods, S. C. Johnson, Ralston, Kimberly Clark, and Sears. During his career, he also worked as a producer for several television and radio commercials including top brands such as McDonald's, American Family Insurance, Speed Queen, and Meijer Stores. After 34 years in Chicago, IL, Richard decided to semi-retire in 2008. He and Linda moved to Sheboygan, WI. They became members of Holy Name of Jesus Catholic Church where Richard enjoyed several involvements including choir, pastoral council, and bible study. During his period of semi-retirement, he did consulting work for Quad Joy, a Sheboygan WI, company who created a computer mouse to assist people who are paralyzed. This was a passion of Richard's as this technology assisted several veterans. Richard is survived by his wife, Linda, his son Randall (Lisa) Laible, of Oak Park, IL, and daughter Claire, (Charles) Cook, of Dubuque, IA, and grandchildren Kristen, Robert, and Max Laible, and Murfee and Kelsey Cook. A brother James (Jean) Laible, sister Francine (Greg) Wohlford. He is also survived by nieces, a nephew, and other relatives and many friends. He is preceded in death by his parents, Raymond and Leona Laible and in-laws Ernest and Marcella Gessert. Mass of Christian Burial will be held on Friday afternoon, December 7th, at 3:00 PM at Holy Name of Jesus Catholic Church in Sheboygan, WI. Fr. Matthew J. Widder, Pastor of the Church will officiate. Burial will be in the Plymouth Woodlawn Cemetery. Friends may call at the CHURCH from 1:30 PM on Friday, December 7th until the time of services. 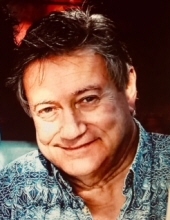 In lieu of flowers, a memorial fund is being established in Richard's name and memorials can be sent to the Suchon Funeral Home, PO Box 535, Plymouth, WI 53073. The family would like to thank Dr. H. Marshall Matthews and the entire staff at Matthews Oncology Associates for their compassionate and excellent care. A special thank you to the doctors and nursing staff serving the fourth floor at St. Nicholas Hospital. In addition to the support in Sheboygan, Richard was also treated at the University of Arkansas Medical Center Multiple Myeloma Institute in Little Rock with comprehensive care as well as Froedtert Hospital in Milwaukee, WI. The family is also grateful for Fr. Matthew J. Widder and many friends for their support and prayers over the course of Richard's fight to live with cancer. To send flowers or a remembrance gift to the family of Richard A. Laible, please visit our Tribute Store. "Email Address" would like to share the life celebration of Richard A. Laible. Click on the "link" to go to share a favorite memory or leave a condolence message for the family.